Getting caught in bad weather without any advance notice can be really bad, because not only will it delay your schedule but it also might also be fatal for your life. So it is always better that you keep an eye out for the weather forecast to stay alert and in the clear always. How amazing will it be if you have weather updates about your locality in advance whenever something major is going to happen! Now with Apple Watch, you can keep the weather forecast literally on your hand. There are some amazing free weather forecast apps that work best for you, all of which can be found with convenience in the Apple App Store. Now let’s take a look at these extremely useful Apple Watch apps that are going to make your life thousand times easier. Tips: if you lost any important notes or messages on iPhone, you can always use Gihosoft iPhone Data Recovery to get back the deleted messages with or without backup easily. The Weather Channel is known for its precise and real-time weather forecasts. The best part about this app is that besides the daily and the weekly weather forecast reports, it also gives the hourly updates. So if you have your plan after a few hours, you can easily check this app out and find out whether you can have a good day. The home screen of your Apple Watch will change as per the current atmospheric conditions. This is also going to help you to keep track of all the storms that are approaching. In addition, the original Weather app installed on iOS devices by default is supported by the Weather Channel as well. WeatherBug is a famous Apple Watch weather app known to provide flawless and updated weather forecasts. The ever changing conditions of the atmosphere are predicted in this app as much as 10 to 15 days in advance, so that you can plan your month beforehand. There are also spark lightning alerts given by this app, which can be extremely useful and even save your life. You can also check out the real-time conditions of the traffic, so you will know which road to take and which to avoid. This is going to be your new favourite app if you are planning to do any outdoor activities. As a weather forecast app, NOAA Radar Pro is like a fully-equipped weather station Satellite overlay displayed on this app will give you the real-time precipitation of any place. For altering the speed of the animation, you can even change the number of frames that you see per second. This is a really creative app. and if you have kids whom you are trying to explain about the weather, then you will find this app to be really useful. The animation is a fun way for anyone to start learning about nature changes from an early age. 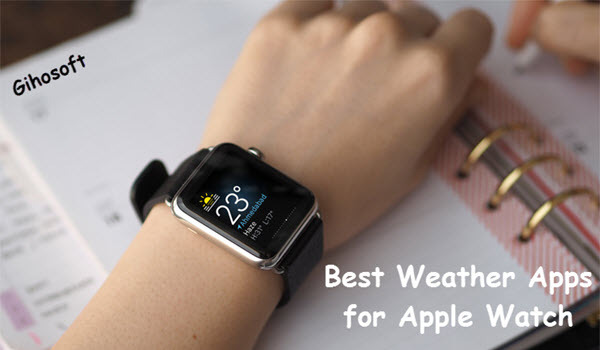 AccuWeather is one of the most popular accurate weather forecast apps for Apple Watch. The main reason why Accuweather is loved so much is that it gives weather forecast in over 100 languages, larger than any other government-based or private weather forecasting platform. It also offers animated satellite images as well as radar images for stormy weather. 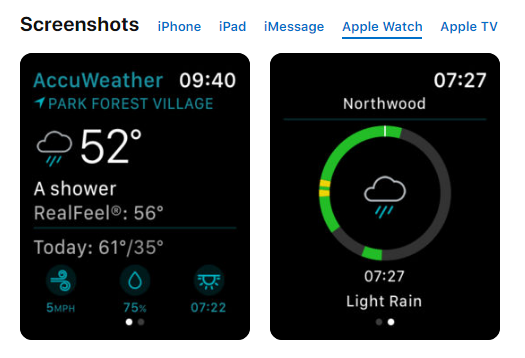 As one of the best weather apps for Apple Watch, Weather Live has an user-friendly interface that is crafted in a way to deliver you the perfect weather forecast of multiple cities. It also provides a weather widget that can be placed in the notification center to helps you check the accurate forecast as well as the current weather quickly. You can also view the weather of any place by zip code, the postcode, the airport code or just the city name. This app is one of the most useful in this list and will enhance your life once you start using it every day. 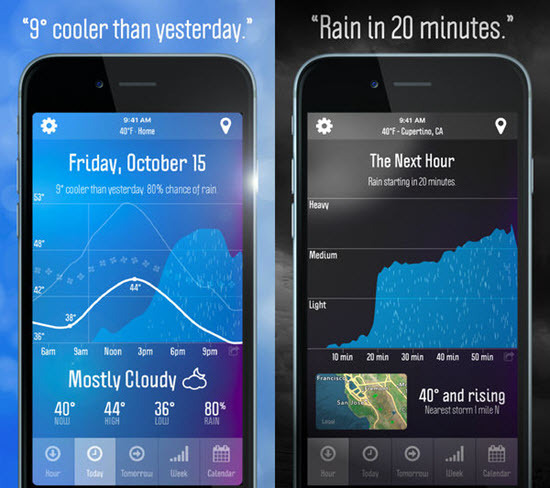 Dark Sky is one of the topmost weather apps for your Apple watch. It has a great foresight and will provide you with the accurate weather from the next day to the entire week. It uses GPRS to give the exact weather report of your present location, offering updates minute by minute. You can easily get a notification when bad weather is about to happen, and you can stay alert about it beforehand. It has also a radar animation feature to let you see the real path of a coming storm. The best thing about Carrot Weather is that it has a minimalist user interface that provides us with hourly, weekly as well as daily predictions. The weather data provided is really useful for daily life, as it has satellite image that will give you the complete updates regarding the places you concern. So all in all this is going to be your new friend that will steer you clear from any danger if you have it on your Apple Watch. Yahoo Weather is known to provide a completely precise 5-day as well as 10-day weather forecasts. Not just that it also predicts all the necessary weather conditions such as the pressure, the wind and the precipitation of a day, some of which may not be commonly found in the other apps. This Apple Watch weather app also helps you to keep a note on the weather of your favorite places and locations. This app is GPRS based and has supported for many languages like Bengali, English, Catalan etc. for people all across the world. Weather Underground gives you all the hyper local forecasts, and at a glance, you will get to see all that you need to know, such as feels-like temperature, wind speed etc. You can also compare what you have on the present day to the previous historical data of the weather. This will let you reach some new conclusions about the weather record. Also, this weather app for Apple Watch has the amazing option to give you alerts whenever something alarming like storms is about to happen. So that way you stay in the safe zone always and avoid risking your life in case there is some natural calamity. 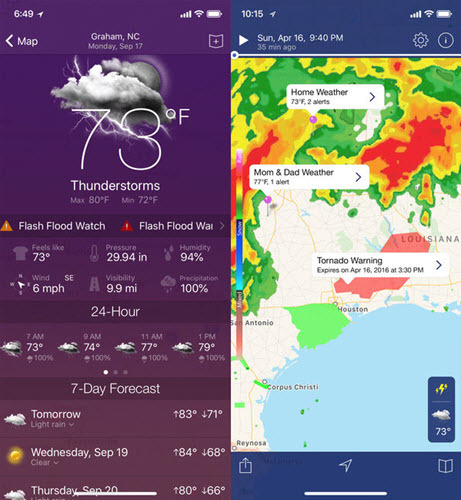 When it comes to precision, Weather Nerd is the exact app you can trust. If you have calendar events, then this app will give you accurate weather forecasts regarding those days so that you can plan your things accordingly. The daily reports are extremely detailed giving you helps to stay updated about climatic conditions. It has as well radar image right from the satellite to keep track of the changing weather continuously. The weekly weather forecast is also represented in the form of a graph in this app for easy viewing. So these are the top 10 weather apps for your Apple Watch that will help you stay completely up to date with the weather conditions. All of these apps are extremely crucial for planning and also for your personal well being, so make sure you get them from the apple store as soon as you can, for these apps will help you quite a lot in your daily life. If you have any question or other suggestion, welcome to leave a comment below.